Welcome to KT Blue Creations! Please be sure to check my SHOP ANNOUNCEMENT for current production times & notifications. 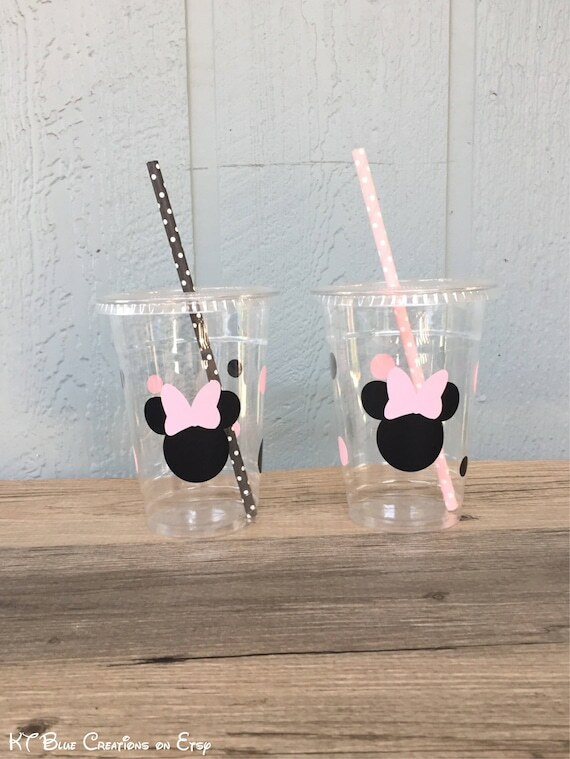 You’re viewing a listing for Minnie Mouse Party Cups in pretty shades of Light Pink & Black! Each 16oz disposable plastic cup is made with 25% recycled PET plastic. This crystal clear plastic cup is crack-resistant so you can confidently serve lemonade, fountain drinks, smoothies, and more! You can also use as a party favor and fill them with treats, snacks or small toys! All cups come with a coordinating paper straw and plastic lid. They are beautifully decorated with durable matte vinyl stickers. ♥ NEED MORE THAN 20 CUPS? Larger quantities here: https://www.etsy.com/ktbluecreations/listing/612559307/minnie-mouse-party-cups-light-pink-black? These party cups can be customized. If you would like to add a name, it is an additional $0.25 per cup. If you would like to add custom text (ex: Happy 1st Birthday), it is an additional $0.50 per cup. Please message me with details and custom requests. If you would like a different color Vinyl Sicker, please send me an e-mail and I’m sure I could accommodate your request! ♥♥ COPYRIGHT DISCLOSURE: I do NOT sell characters, character images or clip art. I maintain the copyright on all my designs, but any licensed character images maintain the copyright of their original respective owners. The licensed character images utilized in my party décor are not being sold, they are given to you at no cost. They are permitted for a one time personal use. Payment & sale in this listing is for my service offered, including the custom text and custom design for personal use. Seller does not claim ownership over the characters used in your customized item as they belong to their respective copyright holders. You are paying for my design time and material used in creating your event decorations. This listing is NOT a licensed product and is consistent with private sale according to the first sale doctrine. Need matching décor? Please ask and I'll be happy to create it for you! ♥ VERY IMPORTANT: Please DON’T FORGET to leave your event date in the “NOTES TO SELLER” during checkout, so I can ensure it arrives in time for the celebration!! ♥ Orders generally ship within 5-8 business days of cleared payment (EXCLUDING weekends), unless prior agreement has been made. ♥ Current processing times can be found posted in the “SHOP ANNOUNCEMENT” on my home page. ♥ If you need an order sooner than the posted processing time, please inquire before purchasing and I will try my best to accommodate. ♥ All items are made to order. ♥ Colors may vary slightly due to monitor color restrictions. I will always do my best to provide accurate descriptions and detailed pictures. ♥ I am happy to answer all of your questions! Please message me, if needed. ♥ Priority 1-day, 2-day/3-day shipping is available for an additional cost. If needed, inquire before purchase. ♥ Shipping notification will be send with tracking number, via an Etsy e-mail, once your order has shipped. ♥ I DO SHIP INTERNATIONALLY :). Please inquire for a shipping quote. Many thanks & warm wishes!